I have searched a ton, on this site and another site. I keep hearing everyone say if I can afford the classic to go with it over the Artisan. Seems reasonable to suggest the more epensive rig is better I guess. What I have found is the few that talk about how they adjust the classic, that I have found, say they run it at about 3 levels (short,mid and long stroke). I have also ran acoss a few guys that have both and use the Artisan to do most of their work and use the Classic for fine shading only. All of this makes me wonder if the Artisan is more forgiving or simply easier to get the same results for basic work than the classic or if the added fixed ratio of adjustability in the classic isn't fixed at a ratio some engravers like. Just trying to understand why if someone had both they would rather use the Artisan for most of their work. It's not really about the 400.00 difference as much as getting the one that I like the best really. I have heard several folks talk about the expense of all the collets they have bought for other systems so that price would I guess have to be considered in the Artisan. The way I understand it the Classic holds the graver in place by either a set screw or an oring. How does the oring keep it from just turning without a flat spot on the graver touching a set screw? Does having a collet, as opposed to not, help with heavier work due to increased mass? Along that same line would a stainless handle help with heavy work by having less give? I assume the stainless handle will work for the Artisan? What does a person really give up on the heavy side between the two? When I compare to the GRS systems, correct me if Im worng but none of them have an adjustable stroke like the Classic does. The GRS only has adjustable impact speed (the length of stroke stays the same). If I understand that correctly the Aritsan is a closer comparison to their set up? As far as power level does the Artisan with heavy piston have the same, less or more power than a 901 handpiece? I don't feel like these questions have been directly answered on either forum and may be helpful for anyone looking at both systems. As far as handles: rubber, burl wood and stainless; there is no difference in power. Possibly slightly with the stainless but don't purchase a stainless handle for that reason. The Classic and PalmControl are already set up to do quick change without collets by only using 3/32" square gravers themselves. Below are the methods in the manual about changing gravers in the Classic and PalmControl. If switching a lot, I use method #1 (no collects needed) or method 2 is also quick. For work on the knives I didn't change gravers very often and so I would use method 3. 1: Slip a graver in and out of the tool hole. Gravers are held from rotating or falling out of the tool hole because of the oring, yet they may be pulled out or pushed in easily. This works best with 3/32" square shank gravers. To prepare the tool, insert a 3/32" square graver and leave the setscrew slightly backed off from the surface of the graver. The screw acts as an index in this way and the friction of the O-ring in the front of the tool hole prevents the graver from falling out. Once the setscrew is set, it does not need to be adjusted to change gravers. 2. Utilizes a thumb screw for a more secure grip. This will work with any shank graver (round or square) under .133" in size. Remove the setscrew and use the knurled thumbscrew in its place. The graver can be tightened down for a more secure grip than #1. 3. The third way to use the tool holder is with a set screw and wrench. This will provide the most secure hold. It will work with any shank graver (round or square) under .133" in size. 4. The fourth method is to remove the setscrew or thumb screw from the AirGraver's nose completely, and just slip the 3/32" square graver shanks in/out. It is similar to #1", but with the set screw completely removed. The rubber o-ring is then all that is used to hold the graver in the tool hole. 5. Last method is using the quick change extensions for the Classic. They provide extra length for large hands or if wanting to get more use from a short graver. The Artisan hand piece together with foot control, idle adjust regulators is $844. This is the least expensive AirGraver® , together with a tungsten piston it is more versatile in power and speed than any competitor's top-end product. Top end power with the stainless piston is reached around 60psi where as the tungsten piston can be taken up to 80psi. The tungsten will really will kick-in up in that psi. If desired to keep the overall price down of a system an air compressor can be expensive. 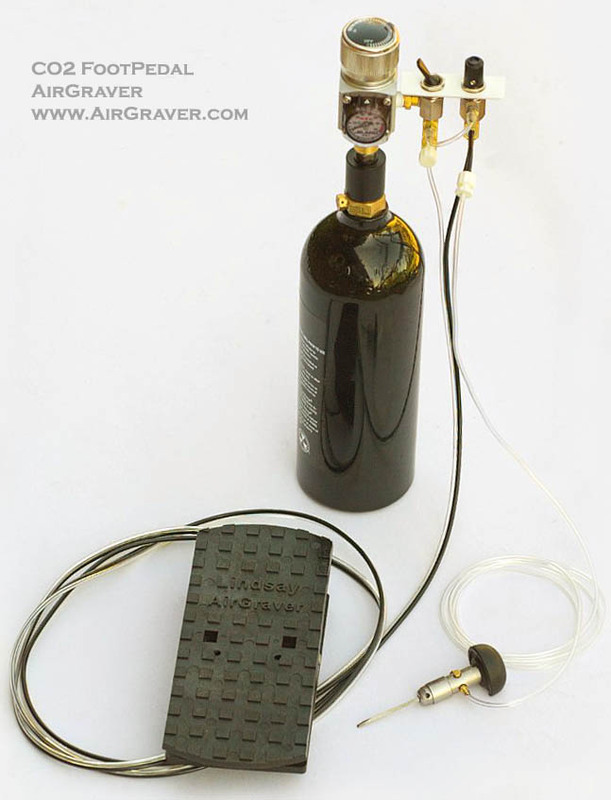 However, because the AirGraver®s do not require very much air volume, the smaller inexpensive compressors work fine. Ace hardware and Wal-Mart carry a $59 compressor as well as a $99 one. They aren't as quiet as the Silentaire compressor but other than the noise they do fine. One way around the noise problem is to place the compressor in another room or in your garage and run an air line through the wall. Below is a chart. It shows the various impact speeds at different stroke adjustments of the Classic handpiece. The Artisan doesn't have this stroke adjustment but is fixed at the mid stroke length. Follow the "Medium Stroke" speeds on the chart to see the speed ranges for the Artisan. The tungsten piston also works in the Artisan and there is a column for that. Follow the medium stroke column there too. For both the Artisan and the Classic the PSI ranges are adjusted with the foot control or the PalmControl® handle. Steve or anyone else, does the Artisan having a collet design handle heavy work as well as the classic being the greater mass of the artisan even though the classic can be adjusted to a longer stroke? I wanted badly to see if I could drive over and compare the two when I was in Omaha last weekend but I just got on blood pressure med and wasn't feeling well enough to travel. Steve or anyone else, does the Artisan having a collet design handle heavy work as well as the classic being the greater mass of the artisan even though the classic can be adjusted to a longer stroke? The Classic has more top end power than the Artisan because the stroke can be set longer than what the Artisan is set at. The Classic also has more low end power control than the Artisan because the stroke on the Classic can be set shorter than what the Artisan is set at. I hope the blood pressure gets under control easily. The tools do have a three week return time. So if you get one and decide maybe the other would be better for you we can swap and add/subtract $ for difference. I have used all of the pneumatic engraving tools, and the Lindsay air graver is the best . No other mfg can match the intuitive feel and ergonomics. I have a classic foot control and a palm control. I use the palm control every day about 4 to 6 hrs. Going on close to 10 years and still working fine. Buy one you won't regret it. Thanks guys. In our temp location I have no shop just a corner in the house so noise is a consideration. Could I just fill up my portable tank (20 gallon) and get a few hours of cut time? I have a very loud compressor that I could fill the tank with when it would be OK to make some noise. I am considering the ultra quite compressors that Home Depot sells but thinking a tank is what I already have and it would also be portable. I did consider the co2 set up but there is only one place that fills paint ball tanks around here and they only have one person that is able to do it so have to catch them at work or travel 35 mils one way to the city. I have considered a larger co2 tank (20lb)and could just get it filled with my torch tanks when needed. What would I need to run on both air compressor air as well as co2? I have a 60 gallon compressor and when I was engraving full time for a living, I could let it fill up to 100psi, shut it off and I was good for a week to ten days before the psi was low enough that it needed to be turned back on. Being in one location I would recommend your large 20 gallon tank or a small quiet compressor like you are talking about rather than using co2. The co2 is nice for being portable, but a pain having to keep refilling cylinders. Wow Steve that's great! I had no idea it would last that long. Very big plus in my book. The reason why I ask about co2 is camping and traveling. I could take my air tank though as it sound like I could get at least a few days from my 20 gallon. How long a tank or co2 cylinder will last is of coarse relative to how much throttle (depth of cuts) you are giving it. To get your 20 gallon tank to last as long as possible check all the connections that there are no leaks between the AirGraver regulator and the tank. Squirting some windex on the connections works well to check. The connection will make bubbles if leaking. The foot control setup uses more volume than the PalmControl. Below is a pic of the foot control setup with co2. This co2 setup is $329 (you supply the co2 paintball cylinders). This only works with 20oz paintball cylinders though. If you'd like to use a larger cylinder you would need to find a co2 regulator that fits your tank. The air compressor regulator dual regulators with foot control is $249. If you'd like both you could use the same pedal and I can supply some white disconnects on the end of the foot pedal lines so you can move it between setups. If going with one pedal for both air and co2 regulators it would be $100 less, since the pedals are $100. Originally I ran my Classic just off of CO2, later I added the 'regular' regulator so I can run off of my compressor. I have a 20lb CO2 tank that I get refilled as needed (actually they swap you a new, full tank around here so you never have to worry about your tank getting out of certification). I have the simple little setup to fill the 20oz cylinders off of the 20lb tank. These days I run primarily off of the compressor with CO2 for travel or if I want to work while the ever-indulgent wife is sleeping. My compressor's not terribly loud by my workspace is in the garage directly under our bed. Funny bit: I have a flexshaft hanging from the roof of the garage, screwed into a ceiling stud. It's really very quiet - on my end. As we learned early one Sunday morning, my ceiling stud is her floor joist and apparently it transfers quite a lot of sound to someone who's head is pretty much right above it. So no flexshaft work if she's sleeping. If you want to be able to switch between a compressor and CO2 have Steve add quick connects to the air lines of your AirGraver (whichever one you get) so you can switch between regulators. They're nicer than just pulling the hose off of the barb of one and sticking it on the other. +1 Classic. I try to cut in about everything i come across, and am not shy about changing the stroke from way light on softer metals like aluminum 18k royal yellow, fine silver, to near wide open on harder metals. 100% glad I spent the extra to have versatility. Its kind of one of those things where Id rather have it and not need it all the time, instead of need it and wish I did have it. I use other GRS tools every day in my work and love their products, just the Lindsay to me is superior when it comes to powered engraving. I've used 3 different GRS engraving systems and would not trade my classic.. Ever. I use a little cheap Compressor from a woodworking store, brand is Rolair. think is was like $220. It is a silent operating system so its like 60 decibels. Thats just over an average conversation noise level. It's better to get engraving then just sit there thinking about it. If your budget is $700, go for it. The artisan is a great tool. Remember it's not the tool that makes great engraving. It's the person driving it.